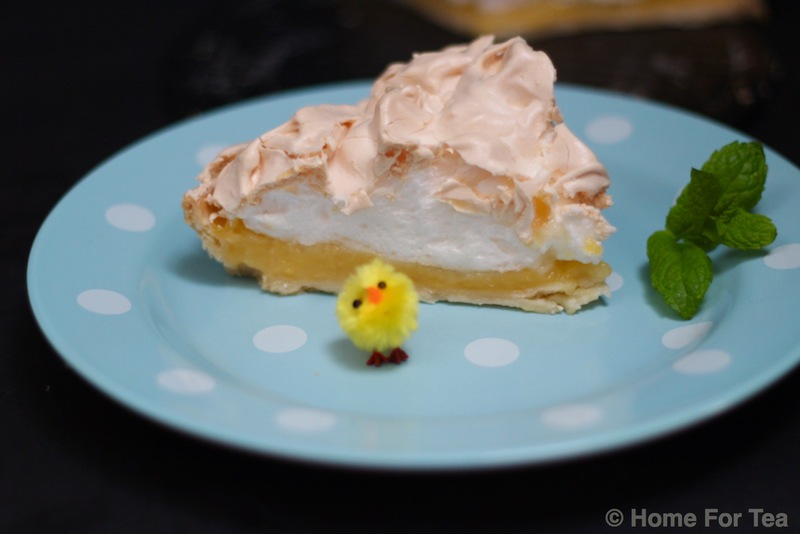 PS – if you have some lemon mixture left over, put it in an ovenproof ramekin and top with some meringue mixture for a delicious dessert (without pastry). Time: 25 / 30 mins prep. Wrap the pastry in clingfilm and chill in the fridge for 30 minutes before rolling out. Drape the pastry over the rolling-pin, gently place it into the tin and press into the sides – don’t trim the pastry yet as it will shrink when it is baked in the oven. Remove the paper and the baking beans and leave to cool. Pour the rest of the water and the lemon rind into a saucepan. Transfer the mixture back to the saucepan and bring back to the boil. Remove the pan from the heat and beat in the egg yolks and lemon juice. Place the egg whites in a large spotlessly clean bowl and whisk until they form stiff peaks. Beat in a quarter of the caster sugar at a time until it is all incorporated, then gently spread the meringue mixture all over the filling so it seals the top completely. Make a few decorative swirls if you like too! Leave to cool then savour and enjoy!